1. Preheat oven to 350, and boil rotini until al dente. 2. Heat about a tsp of olive oil in a skillet. Saute red pepper in oil for a few minutes. Add baby spinach and garlic and cook until spinach starts to wilt. Add soy crumbles and cook until thawed. 3. 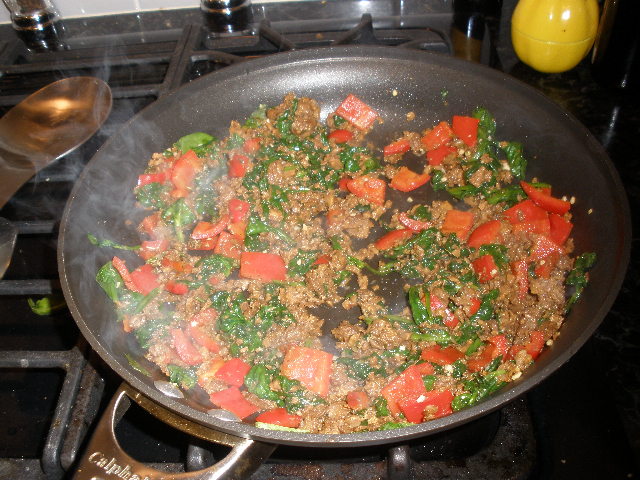 Put spinach mixture in a large bowl and add pasta sauce and 3 Laughing Cow wedges. Stir until cheese melts. Add pasta and mix well. 4. Coat a 9×13 baking dish with non-stick spray. 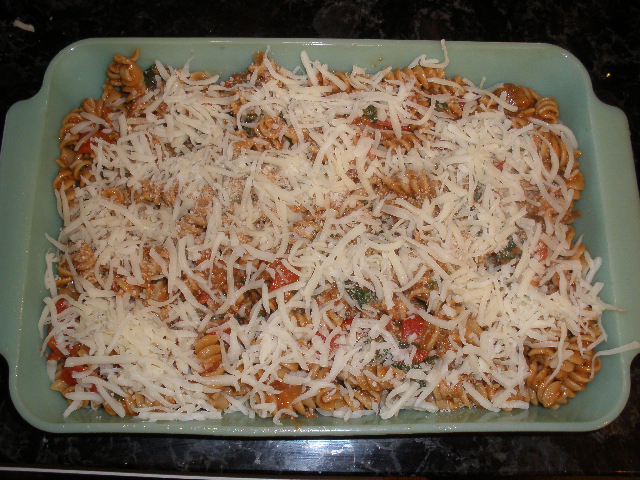 Spread pasta mixture in dish. Top with mozzarella and bake 20-30 minutes, until cheese is melted. 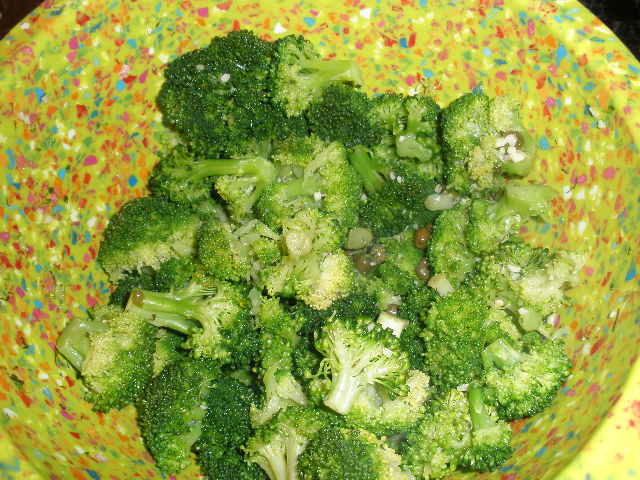 On the side is just some steamed broccoli. I made a sauce of Brummel & Brown, lemon juice, white wine, capers and dill to go on top. YUM. Okay- I have a secret to share with you guys. You may have noticed that I only include pictures of my right hand, never the left. Well, don’t laugh at me… but it’s because my left hand is GIGANTIC. OOOOH, I crack myself up! I’m actually in the midst of a very top secret baking project right now and needed 2 ripe bananas. Well let me tell you right now: if you don’t have ripe ‘naners at home already then you’re pretty much screwed, my friend. I found this out the hard way tonight at the grocery store. All of the standard bananas were grass-green. 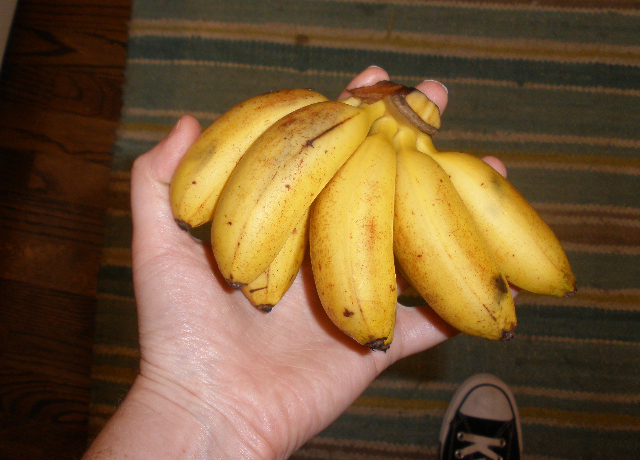 I debated substituting plantains (nah, not really) but then lo and behold, Albertson’s had these little monsters: mini bananas. I figure it probably takes the entire bunch to equal 2 mediums, but at least they’re ripe! This entry was posted in September 2008 and tagged baking, Recipes, Vegetarian. Bookmark the permalink. Thanks for the step-by-step ziti! It looks amazing! I can’t wait to see your top secret baking project. I’m curious as to what you think of those mini bananas. I bought them when they were green once and for some reason, they never really ripened. It was blech. It looks likes yours are perfectly ripe though, so maybe I just had a bad bunch! Either way, I’m sure your baking project will be spectacular! Is that a Rachel Ray garbage bowl? Can’t wait to see what you and your giant left hand bake up! I’m excited for the project! Woo! Do you like the soy crumbles? And does Brian? I like them, but Bill can’t stand the texture. He refuses to buy them..
Bananas do ripen quicker in a brown paper bag, but if you needed them right away that wouldn’t be too helpful! Good-looking dinner, I did something similar the other night yey for resoursefulness! Hey Heather – Believe it or not this is the first chance I’ve had to read your blog. And as your sister-in-law (closest we’ll have to sisters) that’s just sad I think. I keep waiting to get to try some of these fancy dishes! 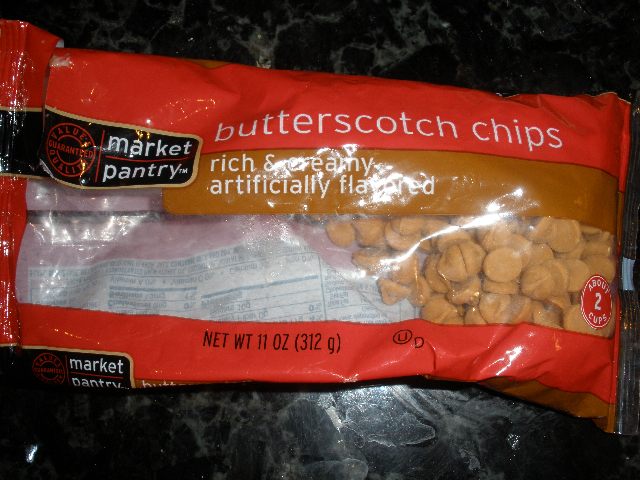 I look forward to see what can be made from those tiny bananas and butterscotch. That’s my kind of recipe! 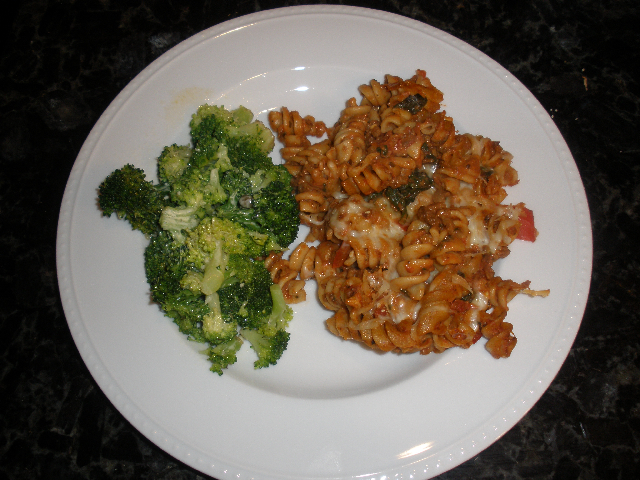 No joke i have made the same exact dish… it just seems to all go together! Rose-We both really like the soy crumbles. I only use them in spaghetti sauce and chili, though- so you can’t really taste them (they just add texture). What did you use them in? Maggie- Hellooooo! Welcome to the blog How are my niece(s) doing today?